Crockford, S.J. 2012. A History of Polar Bears, Ringed Seals, and other Arctic and North Pacific Marine Mammals over the Last 200,000 Years. Unpublished report for The State of Alaska and The University of Alaska Fairbanks. Crockford, S. 2008. Analysis of vertebrate fauna from Adak Island site ADK-011, Alaska. Report on file, prepared for D. West, University of Kansas, NSF Grant #0353065. Frederick, G., McKechnie, I., and Wigen, R. 2006. Faunal report for the Huu7ii Archaeological Project: results from the 2004 excavations (at DfSh 7). Report on file, for Huu-ay-aht First Nation, Anacla BC. Frederick, G. and S. Crockford, 2005. Appendix D: Analysis of the vertebrate fauna from Ts’ishaa Village, DfSi-16, Benson Island, B.C. In: A.D. McMillan and D.E. St. Clair (eds. ), Ts’ishaa: Archaeology and Ethnography of a Nuu-chah-nulth Origin Site in Barkley Sound. Simon Fraser University Press, Burnaby, BC. p.173-205. Crockford, S., G. Frederick, R. Wigen, and I. McKechnie. 2004. Analysis of the vertebrate fauna from Amaknak Bridge, Unalaska, AK, UNL050 (Final report). Report on file, Museum of the Aleutians, Unalaska, AK. Crockford, S. 2003. Prehistoric occurrence of short-tailed albatross and other avian species as documented by analysis of selected archaeological faunal assemblages in coastal British Columbia. Report on file, Canadian Wildlife Service, Victoria, BC. 2009-2014 Analysis of vertebrate fauna from site DjRw-14 on Salmon Inlet, Sechelt, with Gary Coupland and David Bilton from the University of Toronto, Ontario. 2009-13 Comparison of ancient DNA extraction/analysis techniques with Brian Kemp (National Institute of Justice Grant), School of Biological Sciences, Washington State University, Pullman. 2008-09 DNA identification of prehistoric goose remains from Adak Island, Aleutians, with Dr. Brian Kemp and Bryan Wilson, School of Biological Sciences, Washington State University, Pullman. 2007-09 Identification of early Holocene and late Pleistocene fish remains from raised marine deposits in SE Alaska, with Jim Baichtal and Risa Carlson, US Forest Service, Thorne Bay, AK. 2007-09 Ancient DNA analysis of bluefin tuna from Vancouver Island, with Liz Alters and Carol Reeb, Hopkins Marine Station, Stanford University (National Science Foundation Grant). 2005-09 Ancient DNA analysis of short-finned pilot whale and other unknown cetaceans from eastern Aleutians, with Greg O’Corry-Crowe, NOAA/Southwest Fisheries Center, La Jolla, CA. 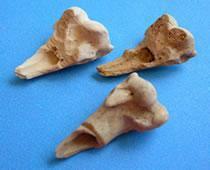 2005-09 Analysis of fur seal remains from La Push, WA, with Gary Wessen. Wessen & Associates, Seattle. 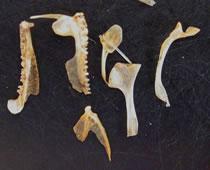 Top: mid to late Holocene-age small fish bones (a goby) from a cave deposit on Prince of Wales Island, SE Alaska.